Similar to constructing dykes and levees that separate land from water, data protection is increased by placing barriers between IT resources. Cloud resource segmentation is a process by which separate physical and virtual IT environments are created for different users and groups. For example, an organization’s WAN can be partitioned according to individual network security requirements. One network can be established with a resilient firewall for external Internet access, while a second is established without a firewall since its users are internal and unable to access the Internet. Resource segmentation is used to enable virtualization by allocating a variety of physical IT resources to virtual machines. It needs to be optimized for public cloud environments, since organizational trust boundaries from different cloud consumers overlap when sharing the same underling physical IT resources. The cloud-based resource segmentation process creates cloud-based security group mechanisms that are determined through security policies. Networks are segmented into logical cloud-based security groups that form logical network perimeters. Each cloud-based IT resource is assigned to at least one logical cloud-based security group. Each logical cloud-based security group is assigned specific rules that govern the communication between the security groups. Multiple virtual servers running on the same physical server can become members of different logical cloud-based security groups (Figure 1). Virtual servers can further be separated into public-private groups, development-production groups, or any other designation configured by the cloud resource administrator. Cloud-based security groups delineate areas where different security measures can be applied. Properly implemented cloud-based security groups help limit unauthorized access to IT resources in the event of a security breach. This mechanism can be used to help counter the denial of service, insufficient authorization, and overlapping trust boundaries threats, and is closely related to the logical network perimeter mechanism. 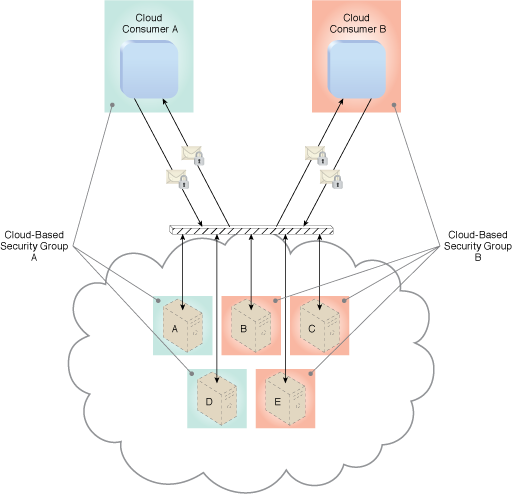 Figure 1 – Cloud-Based Security Group A encompasses Virtual Servers A and D and is assigned to Cloud Consumer A. Cloud-Based Security Group B is comprised of Virtual Servers B, C, and E and is assigned to Cloud Consumer B. If Cloud Service Consumer A’s credentials are compromised, the attacker would only be able to access and damage the virtual servers in Cloud-Based Security Group A, thereby protecting Virtual Servers B, C, and E.
in Module 8: Advanced Cloud Security. For more information about this book, visit www.arcitura.com/books.